A call to Bernie Challis at Van Der Vliet Quality Yachts brings more details of his latest central agency for sale, Esterel's 33.2m patrol-style motor yacht Xiphias. Designed by Jon Bannenberg and commissioned in 1974, this mahogany-hulled superyacht accommodates eight guests in an owner's suite and three staterooms. She was refitted in 2002 and 2008 and recently completed a total interior refit to create a minimalist yet warm, modern ambiance. 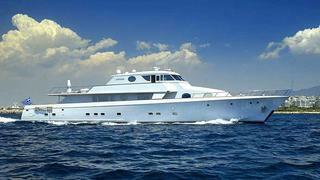 With twin 1350hp engines giving her a cruising speed of 19 knots, Xiphias is asking €2.375 million.